LMI Technologies is the global leader in 3D scanning and inspection. We work to advance 3D measurement with smart sensor technology. Our award-winning, FactorySmart sensors - Gocator, improve the quality and efficiency of factory production by providing fast, accurate, and reliable inspection that leverages smart 3D technologies. Unlike contact based measurement or 2D vision, Gocator has complete 3D intelligence built-in so you can scan, measure and control processes with reduced complexity and implementation cost. Automate 2019 highlights the full spectrum of automation technologies and solutions. LMI Technologies sees Automate as an important event to showcase Gocator products being integrated into both traditional applications and new cutting edge technologies. Gocator works seamlessly with automation equipment and control systems (such as PLCs and robots) to provide vision-guidance, 3D measurement, and downstream control decisions for factory automation applications. Automate will be a place of conversation for people across all industries: Automotive, Consumer Electronics, Packaging, Road and/or Wood who all have similar needs of in-line automation processes or interest in smart 3D robot vision applications. We hope to solve automation challenges of attendees through providing a variety of solutions through our Gocator Laser Line Profilers and Gocator 3D Snapshot sensors to increase productivity, eliminate manual error, improve quality and flexibility within the manufacturing process, lower operating costs and increase worker safety. LMI will have five demos on display covering complete 3D inline inspection, wide field of view measurement, robotic integration and snapshot sensor solutions. With a variety of Gocator technologies present, visitors will be able to play around with large and small field of view applications and experience 3D models which can be generated within seconds of a scan. Visit booth #8157 and see how LMI scans it all; Big and small. LMI Technologies launched the Gocator 2500 Series in November 2018. Located within a playground environment, attendees can perform scans themselves and see firsthand how this high-speed laser profile sensor provides complete 3D inspection at blazing speeds up to 10kHz. Visit and see just how using blue-laser technology produces “cleaner” data on shiny/specular targets and why this high-sensitivity Gocator addition addresses the growing demands within the Consumer Electronics market. Larger field of view scans are necessary for certain industries such as packaging, wood and road. The Gocator 2880 can scan up to 1.3m wide and 0.8m high which is the largest field of view laser line profiler available in the market. Featuring dual cameras to eliminate shadowing the Gocator 2880 can handle a variety of scanning objects within a single sensor. 3D smart sensors give the power of “sight” to robotic quality inspection systems. During Automate, LMI will have the Gocator 3210 Snapshot sensor mounted on the end of a Universal Robot to provide ‘eyes’ to the collaborative robot. This demo will showcase how collaborative robots when given the right vision technology can work side by side with humans enabling a fully-functional multi-model production line to work at a much faster, more efficient pace than traditional single-model assembly lines. At LMI Technologies we work very closely with our partners to ensure we have a variety of solutions developed and specialists to meet the needs of all customers across different industries. At Automate this year, Prolucid has confirmed they will have their Gocator solution on demo showcasing how a Gocator Snapshot sensor can be used to measure the height, depth and dimensions of electronic parts to perform quality inspection practices. A key component of attending any show is allowing our engineers and sales team to walk the floor and interact with other exhibitors. What LMI representatives typically look for is new technologies using 3D measurement as well as machine builders who have potential for integration with 3D technology. Trade shows also provide a great opportunity to look at what competitors are exhibiting to gain an understanding into their areas of focus. Tradeshow’s provide a great opportunity to network with existing customers, partners and system integrators as well as interacting with potential new customers, partners and system integrators. Through attending educational sessions, it helps to gain an understanding of industry trends, interests and focus of certain individuals and/or industries. Overall whether within the booth internally or walking the floor, generating conversation with a mixture of attendees is the main focus and a key sign of a successful event. Gocator is increasingly being recognised as a product which can turn any factory into a smart factory. Gocator is backed by the tagline “FactorySmart” due to the complete 3D intelligence built in. By this, we mean Gocator has the smarts to Scan, Measure & Control all within the brains of the software included in the Gocator product. 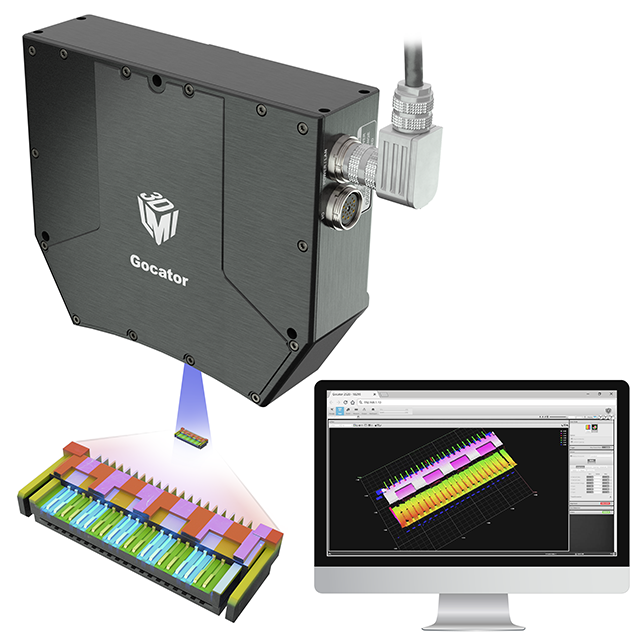 The Gocators easy-to-use, flexible design delivers high-performance 3D machine vision with seamless data communication so factories can operate more efficiently and profitably. Process Automation, Manufacturing control, material handling and storage are at the heart of the smart factory and are manual tasks Gocator hopes to transfer into being Automatic. With the megatrend of robot automation today, customers are realizing they need 3D solutions that provide the ‘eyes’ of the factory and can drive automation to the next level - a smart, dynamic system of automation instead of a preprogrammed, repetitive, inflexible system. 3D scanning can transform any business in the engineering, design and manufacturing, development or testing industries. The technology is increasingly being adopted across the world, not only for improving the speed of the average process cycle but greatly enhancing the overall quality of the end product. At LMI 3D we anticipate the need for 3D machine vision technology is only going to accelerate as factories get smarter, driven by a need for greater quality, efficiency and flexibility. To setup an appointment for a booth demo or visit please email: contact@lmi3d.com alternatively please feel free to come by the LMI Booth located at #8157. More about LMI Technologies Inc.